1. 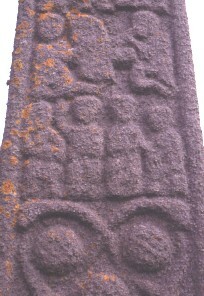 Iona, St. Martin's Cross. West Face, Detail of Psalmist, David and Goliath, and top of lower panel. W2 Lowest ornamental panel: 6 bosses forming two triangles on 12 interlaced serpents.